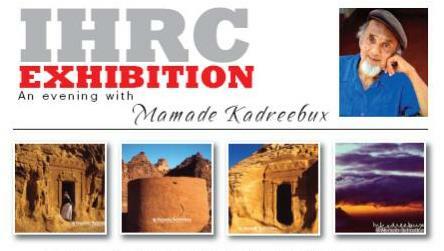 IHRC is hosting an exhibition of Mamade Kadreebux, renowned photographer, painter and writer. The images dating from the 1970s onwards include images from Timbuktu, Mauritius, Yemen, Saudi Arabia and Egypt . The exhibition will run from 25 February until early May. Kadreebux will be available from the morning of 24 February, during the Press Night and afterwards. On the night he will be talking through the images, as well as other images brought along specifically for the night. Proceeds from the sale of the images go towards IHRC Trust and other worthy causes nominated by Kadreebux. Press need to register beforehand by calling 020 8 904 4222, or e-mailing events@ihrc.org. Departing from his native Mauritius over 35 years ago, Mamade has since travelled all over the world. His work, born out of his travels has been exhibited around the world and has been used by international magazines such as The National Geographic. His writings and photographs stand as a testament to his extraordinary journey.